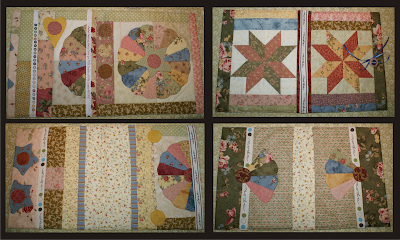 Inspiration to make these journal covers came from a post I saw a few weeks ago on Jill's blog at The Quilt Rat. Her lovely journal cover is here . (She has a great giveaway right now too.) The original inspiration for the journal covers comes from Wanda at Exhuberant Colour . See all her fabulous journal covers here. New ones posted today. 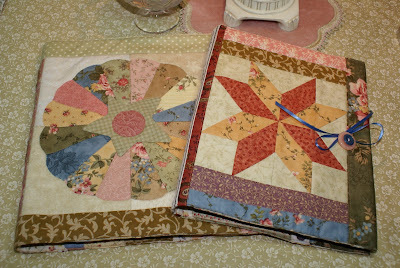 So, I gathered scraps, selvage, ribbon and orphan blocks and made two journal covers of my own. What easy, one-day projects to make and they look so pretty when done. I take my covered notebooks to work with me during the week so I have a place to write down any "quilty" ideas that come to mind. Here is more detail showing the front/back of each cover and the inside flaps. They were so much fun to put together, I know I'll be making more. Lovely work. Very pretty colours too. I have to make one of these one day. These look great and what wonderful gifts they'd make. I've done journal covers but I love the blocks on them a lot. Nice journal covers. You have a beautiful blog!